Episode 68: What was Reconstruction? History is complex, and therefore generalizations are a historian’s inaccurate, crude, and necessary tools. So I’ll make one: The Post-Civil War era of Reconstruction is perhaps the least understood – or, when something is known about it – most misunderstood period in American history. 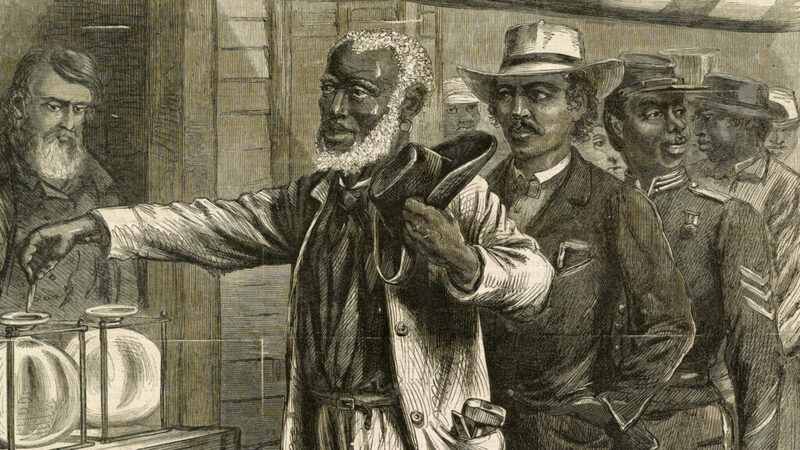 In addition to knowing little more about Reconstruction than the bare facts presented as a footnote in history surveys, many of us have engravings about it. (Lendol Calder and I explore this in an earlier conversation.) To paraphrase Mark Twain on engravings: It’s not the lack of knowledge about history that’s the problem; it’s what we know about it that “just ain’t so.” Reconstruction seems to have more engravings per square foot on the American mind that just about any other era. Our expert witness on Reconstruction is Dr. Douglas Egerton. A professor of American history at Lemoyne College in Syracuse, NY, he has since 1989 produced a literal bookshelf of works on enslavement and liberty. Along with his 2010 Year of Meteors: Stephen Douglas, Abraham Lincoln, and the Election That Brought on the Civil War and 2009 Death or Liberty: African Americans and Revolutionary America, his 2014 book The Wars of Reconstruction: The Brief, Violent History of America’s Most Progressive Era forms, to my mind, a trilogy on the African-American struggle for liberty. This conversation came about as a result of a listener request from Dr. Jerry Herbert. If you would like to hear a conversation about a particular historical event, a historian, a book, a place–or anything else we talk about on this program, I’d welcome your suggestion; please join our Facebook group and post a request. Thanks for listening! • There’s no need to provide a long Reconstruction reading list here, since Civil War Memory’s Kevin Levin provides such a great one. • More Than Anything Else, by Maria Bradby. Children’s literature is often a powerful tool for teaching history. Perhaps with more immediacy than any monograph ever could have, Bradby recounts the experience of a formerly enslaved child (in this case future teacher and college-builder Booker T. Washington), hitherto prevented from reading and learning, as he harnesses the power of words. A brilliant child’s-eye view of the power of the Reconstruction era.